Wearable moon phases exude your favorite essential oil scent. How Does the Moon Smell? The Apollo astronauts said the smell of moon dust reminded them of charcoal or spent gunpowder. Poets and moonstruck lovers would likely put it in more romantic terms. Inspired by the phases of the moon, Jennifer Bravo-Grulkey's aromatherapy necklace lets you scent a wearable satellite with your favorite essential oils. 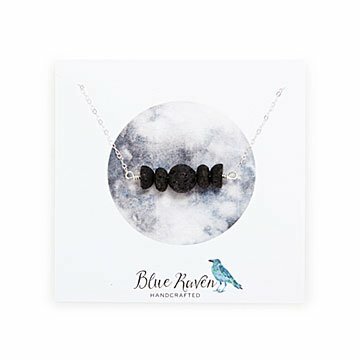 Crafted from absorbent lava beads set on sterling silver wire, the necklace exudes your chosen aroma as you wear it throughout the day. This interactive accessory makes a fragrant addition to any lunar lover's ensemble. 18-inch silver chain. Handmade in Bel Air, Maryland. Necklace sold separately from essential oils. When she was young, Jennifer Bravo-Grulkey would save money so she could buy beads from a little shop in her hometown of Kodiak, Alaska. When she married a man whose job moved every 3-4 years, she realized she needed a job she could pack up. So she took over the dining table one day and started making jewelry. "As a young child I would save my money to buy the most magical and beautiful beads from a little shop on the island," she recalls. "Most of them were too pretty [to use]. I don’t think I ever used half of them, but instead saved them in a tackle box where I had them all organized by color and admired them daily." Today, Jennifer uses gorgeous gems to enhance her aromatherapy jewelry pieces. As she puts it, "I've combined my love for holistic health in essential oils with that of the beauty and healing properties of stone and crystals." Only apply essential oils directly to the lava beads. Remove necklace before showering, swimming, or bathing. Keep chain clean and dry. I bought myself this bracelet hoping it would actually fit my restless bracelet is all that it was described. I just love it it fits perfectly and when I add my scent to the rosewood beads its grounds me perfectly. I was really looking forward to getting this but when I received it the chain had become tangled into a huge knot that could not be undone, I assume during transit. I requested another and it had the same issue just not as bad but there is still a tiny knot. I believe the problem is the material the chain is made out of coupled with the fact that it isn't taped down upon shipment. They should fix this because otherwise beads work very well holding scent of essential oils and it's a very minimal but interesting piece. My friend loves this gift especially with the recent solar eclipse !